Another spring – another season of bird points in the can. Each spring brings its own unique set of adventures, dilemmas and logistical challenges. This season was tinged with poignancy, as it was the first season without long-time (long-time as in, since 2004 when this enterprise began) associate and dear friend Bob Olthoff. It took Bob and me a number of seasons to finally come up with a somewhat stable annual routine. In the beginning just locating and marking all the points was a challenge. 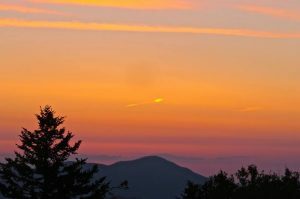 There are around 210 points spread across Western North Carolina in the Nantahala and Pisgah National forests from Hiwassee Dam to the Overmountain shelter along the Appalachian Trail at Roaring Creek and from Roan Mountain to Mount Mitchell to Black Balsam and all the way down to Brevard. The next challenge was trying to group points together and delineate routes to access points in the most expeditious manner. After four or five years we came up with a pretty standard routine and Bob was always there if weather or road closures, etc put us in a bind. While Bob will never be replaced, I was fortunate to find a capable, willing and able subcontractor for this season. Kirk Gardner is a biology major at Western Carolina University who has been bitten by the birding bug. Kirk will graduate in December and kept busy this summer working for Fish and Wildlife Service and helping me. Kirk is not only an excellent birder but he is much more geek-capable than I and has created an avenue for digitally saving and sharing this data that has already paid dividends and has the potential (once I upgrade my printer/scanner) to be a great time-saver in the future. So, a quick look at this survey season – started out cold; on May 1st – kickoff day for the season it was about 35 degrees Fahrenheit in the morning, my girls were playing in a heavy snowfall on Waterrock Knob that morning. The next weekend it rained and it seemed it rained almost any day I set aside for surveying. Roads were an issue this season. Lots of wind and rain over the winter and early spring brought lots of trees down. The Forest Service budget has been sorely lacking for decades and road maintenance (especially behind locked gates) is one of the hardest hit areas. And, of course, the unprecedented wildfires last fall plus spring wildfires kinda dictated where and how resources were used. But with chainsaw and tow-rope on hand I was able to access most of the points and thanks to Kirk taking on some extra points I was able to finish the survey on the prescribed date – June 15. However, even with minor difficulties, being in the woods at dawn offers it’s own slate of rewards; Swainson’s warblers still thick on the Grandfather District and present and accounted for on other points like Hickey Fork; a great year for turkeys, the woods were full of hens with poults; another sonic year for insects with the emergence of Brood VI (17-year periodic cicadas) in parts of the Grandfather District near Morganton. You haven’t lived till you spend a few hours in the presence of tens of thousands of large, beautiful, noisy, hovering insects. We picked up red crossbills and pine siskins around Mt. Mitchell, we don’t get them every year and we had yellow-rumped warblers at Black Balsam again this year – second year in a row. And there are always the near misses. A magnolia warbler was discovered along the Blue Ridge Parkway near one of our points the day after we surveyed. I had red-headed woodpeckers in the Grandfather District, between two points and brown-headed nuthatches in the Beech Creek Seed Orchard in the Tusquitee District, again between points. But sometimes just being up at dawn is its own reward.